India is a continent masquerading as a country. The one state that is pivotal in keeping this statement about its diversity ring true is Tamil Nadu. With a language that is as different from Hindi as Swahili, with the morning cuppa as different from tea as coffee, with the monsoons as different from South West as North East, with the snacks as different from Samosas and Kachoris as Bonda and Vada, Tamil Nadu stubbornly refuses to blend in with the rest. Despite this, Tamil Nadu is hardly ever our first choice for a holiday destination. Tamil is what we call mother tongue. The exotic Avarakkai, the esoteric Rasavangi and the quixotic Avial is what we call lunch. The lethargy bred by this level of familiarity is the sole reason why we never look south of Chennai in an India map. When state of affairs forced us to travel in August, we had nowhere else to go but south of Chennai as the rest of India was drowning in the monsoons. We kicked off the trip by flying into Chennai and hopping on the Cholan (the train, not the empire) to Thanjavur, glossing over all the regions we had once covered. The Cholans (the empire, not the train) put Thanjavur on the map when they made it their capital in the 9th century AD. We started our sightseeing at the post-Chola extravagance of the Royal Complex. Built over three centuries by the Nayaks and the Marathas, this sprawling decaying conglomeration boasts of two sumptuous Durbars, a fantastic library and an excellent collection of Chola bronzes. After a good deal of losing and finding our way around the assortment of various buildings in the complex, we headed to the crowning glory of the Cholan empire, the millennia old Bhrihadishwara Temple. 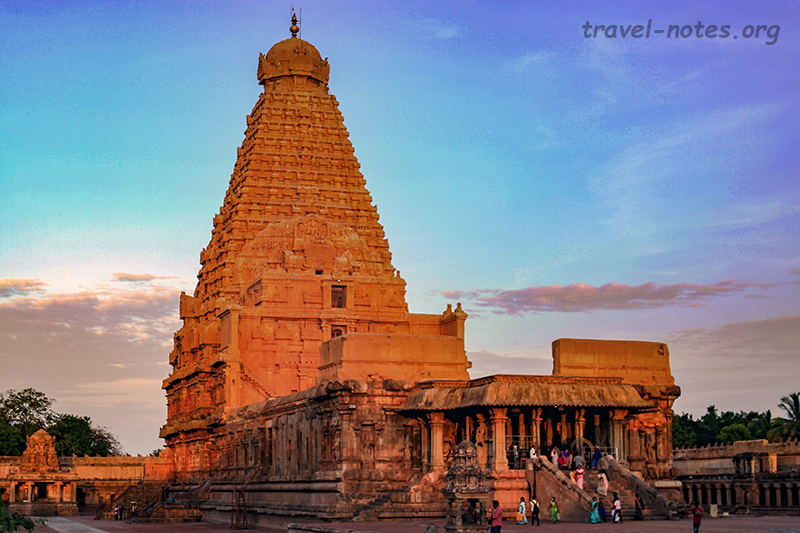 This astonishing masterpiece was built in just seven years by Rajaraja Chola I, the greatest of the Chola rulers. The vimana towers 61 m and is best enjoyed at dawn when it glows in deep orange in the warmth of the morning sun. Although the temple has been embellished by the later dynasties of Pandya, Nayaks and Marathas, thankfully, none tried to impose their presence and the temple has largely remained faithful to its original design. Our next destination was Trichy, which is actually Tiruchirappalli, shortened, because the rest of India couldn't pronounce it. On our way there, the following morning, we stopped by the Grand Anicut, a dam built in the 2nd century AD by Karikala Chola, the most famous of the Early Cholan rulers. This engineering marvel is one of the oldest water diversion devices in the world that is still in use. Srirangam (we are now in Trichy), an island formed by Kaveri and its tributary, Kollidam, hosts an “-est” of its own – the largest temple in India, the Ranganathaswamy. The “-est” can be globalised by adding more adjectives: “Hindu” (to weed out Karnak and Borobudur) and “working” (to weed out Angkor Wat) making it the largest working Hindu temple in the world. Entire humanity in the temple was either in or manning the conga line to see Ranganatha, the main deity, reclining on Adishehsa. After spending an hour in the line and a femtosecond in front of the idol, we walked around the sprawling, desolate temple complex. We got to enjoy the grand Thousand Pillared Hall, the lofty White Gopuram, the stunning Horse Carvings of Shesha Mandapa and the roof top view of a sea of gopurams including the majestic Rajagopuram in complete solitude. After hiding from the harsh afternoon sun in the comfort of our hotel, we spent the evening enjoying the sun set on the city atop the Rockfort, a large rocky outcrop that is home to an assortment of Hindu temples dating back to 7th century. The following morning, we took the slow route to Madurai, stopping first at Narthamalai, home to a little known 8th century Pallava gem – Vijayalaya Choleeswaram. What the guide books didn’t tell us is that to get to the temple, it is a scramble on all fours up a 70 degree granite rock face and a slide on your bottom on your way back and we did both in attire completely ill-suited for the purpose. The temple and the architecture more than made up for the minor inconveniences. The early and the later Cholas, mentioned in passing above, were separated by five centuries of Kalabhra rule, a little known mysterious dynasty, probably patrons of Jainism. One of the few monuments left from this period is the Jain Caves of Sittanavasal, one of which is the only one outside of Ajanta to contain frescoes. Although the paintings are faded, the quality of the artists could be easily discerned. The non-descript inner chamber hides an acoustic masterpiece, it is built such a way that it only amplifies the low bass tones and nothing above it. If you make it all the way here, don’t forget to cajole the caretaker to do a demonstration. Our next stop, the Pudukottai Museum, contained some worthwhile bronze and ivory carvings hidden inside an eclectic mish-mash of everything from stone age weapons to a dancing T-Rex. The final pit stop for the day was at the Thirumayam Fort famous for being the final hide out of Oomaithurai, the brother of Kattabomman, the two major protagonists of the Polygar Wars. Although the road trip for the day ended in early afternoon in Madurai, the history lessons continued as Madurai, after all, is one of the oldest continuously inhabited cities in the world. 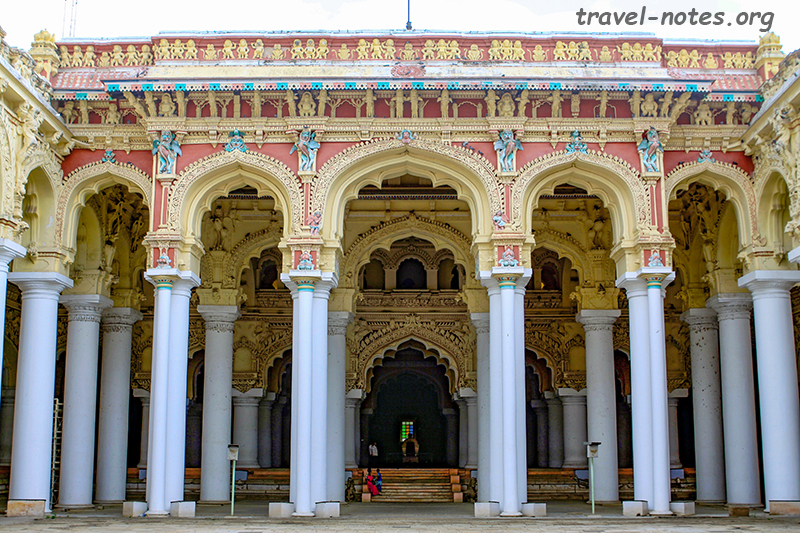 We only had time to check out one of the city’s attraction – the 17th century Thirumalai Nayakkar Palace. Thirumalai Nayak built the palace in 1636 AD with the intention to make it the grandest in South India and the quarter of the palace that still stands bears testimony to the fact that the edifice has met its lofty expectations. The gigantic pillars in the palace are 82 ft tall and 19 ft wide and there are 248 of them and we spent the rest of our day getting lost amongst them. 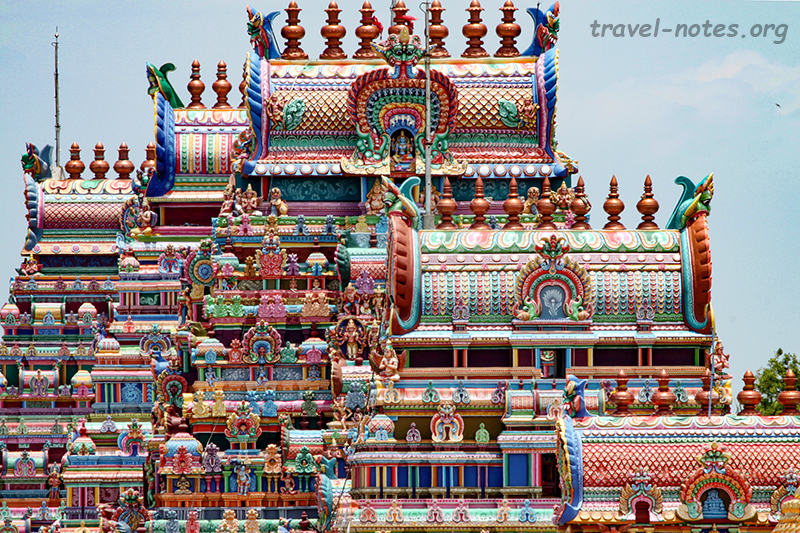 Early next morning, we visited the beating heart of Madurai – the Meenakshi Amman Temple. Legend says that it is here that Shiva, in the form of Sundareswarar married Parvati, in the form of Meenakshi. History says that, although a temple probably continuously existed here for more than two millennia, most of what we can see today date from the Nayak period when the temple was reconstructed from the rubble left by the disastrous visit paid by Malik Kafur. After being amazed by the granite sculptures adorning the famed Thousand Pillared Hall and the more colourful ones exploding from the skyscraping gopurams, we headed to the next big historical attraction of Madurai – the Gandhi Memorial Museum. It was here in Madurai, that the Mahatma was introduced to his trademark dhoti. To commemorate that fact, his last dhoti, the one that he wore when he was assassinated, is kept here in this museum. After paying our homage to the relic, we bid adieu to Madurai and headed to Rameswaram, an island off the coast of Tamil Nadu, and the land mass that is closest to Sri Lanka. Given this geography, it is little wonder that Rama, the hero of Ramayana and an avatar of Vishnu, decided to launch his assault on Lanka by deciding to build a land bridge from here to Lanka. On his way back, Rama built a temple to Shiva to atone for the sin he committed in killing Ravana, a Brahmin. Yes, even an avatar of Vishnu cannot get away with a murder (well, of a Brahmin that is). All this is, of course, mythology and while myth always deals with certainty, history is full of doubt. The historical origins of the temple are lost in the Karabhra confusion and most of what we can see today dates from the Pandyan period. Given that this temple was built by one God to worship another, it is but natural that the temple be conferred with two of the highest honours a Hindu temple can be bestowed with – a Jyothirling and a Dham, the only one to hold both the titles. There are twelve Jyothirlings and four Dhams. With our previous forays (see: here, here, and here), we have now completed the latter circuit which has heaped upon us untold benefits like getting to brag about in an obscure travel blog. Rameshwaram is not all myth and temples. 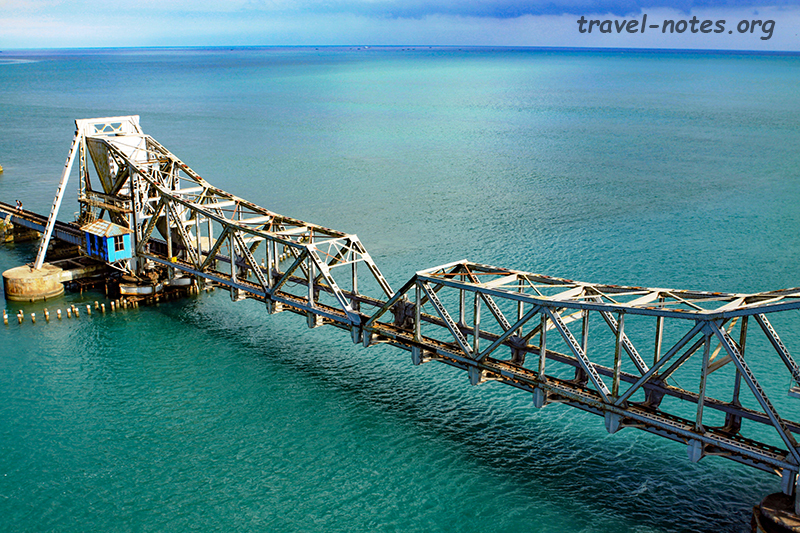 To get here, one has to cross one of two sea bridges, one for rail and one for road, both named Pamban. The rail one dates from 1914 and was India’s first sea bridge, a British era engineering masterpiece and at 2+ km, it remained the nation’s longest until 2010. Rameshwaram is also where the nation’s most loved president, Dr. A. P. J. Abdul Kalam hailed from. In a nation where privilege, birthright and political connections go a long way, visiting the humble abode of a self-made man was an inspiring moment for us. It was also the closest we ever (or ever will) get to a Bharat Ratna or a Padma Award, all of which were displayed in his house turned museum. A five hour drive brought us to Kanyakumari, where India, the land, ends and India, the ocean, begins. The next available land mass south of here is the Antarctic. Not surprising for a nation that has given birth to more religions than any other, the last thing you see on the mainland is a temple – this one dedicated to the virgin Goddess, Kumari Amman. Just off the mainland are two rocky outcrops, both having a photogenic monument each to attract the tourist eyeballs. One on the left is where Vivekandanda meditated for a couple of days before his famous trip to Chicago. The hordes of tourists that visit his memorial here every day, has ensured such a meditative feat cannot be ever repeated. The island on the right houses a 133 ft tall statue of Thiruvalluvar, a 2nd century BC poet and the author of Thirukural, one of the greatest works on ethics and morality ever written. An hour north of Kanyakumari is the Padmanabhapuram Palace, the seat of the Travancore kings who ruled from 1550 for 250 years before moving their capital to Thiruvananthapuram. Built almost entirely of teak wood, this largest and oldest wooden building in all of Asia is one of subdued elegance instead of the usual over the top garishness. After ambling through its various buildings for better part of the afternoon, we caught the Anantapuri to head back up to Chennai. 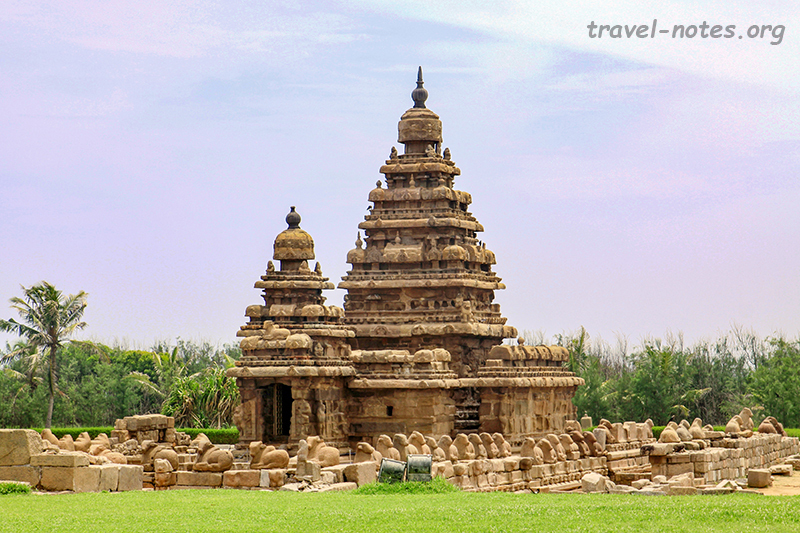 Before we ended the trip, we still had one final stop – the 7th century Pallava coastal town of Mamallapuram. The monuments here are divided into three sections. The first is an assortment of half-finished temples, bas-reliefs and rock cut caves. The Descent of Ganga, largest bas relief on granite on the planet, and the gigantic sculptured panels inside Varaha and Mahishasuramardhini caves were the pick of the lot. The second section (Pancha Rathas, to give it name) contains five unfinished temples dedicated to five different Gods of Hindu pantheon, all belonging to different architectural styles and all misnamed after the Pandavas. The last section houses the only remaining Shore Temple of the once famed “Seven Pagodas”. Although mostly eroded, the exquisitely proportioned temple, with its sea shore setting is sure to take your breath away. After being swept and swooned away by the history, art and architecture of the state, not to forget being fried, broiled and charred by its harsh August sun, our trip finally ended in Chennai, in the company of two of my undergraduate classmates and the two of the many success stories from our batch. Click here for more photos from Thanjavur. Click here for more photos from Brahadeeswara Temple. Click here for more photos from Trichy. Click here for more photos from Madurai. 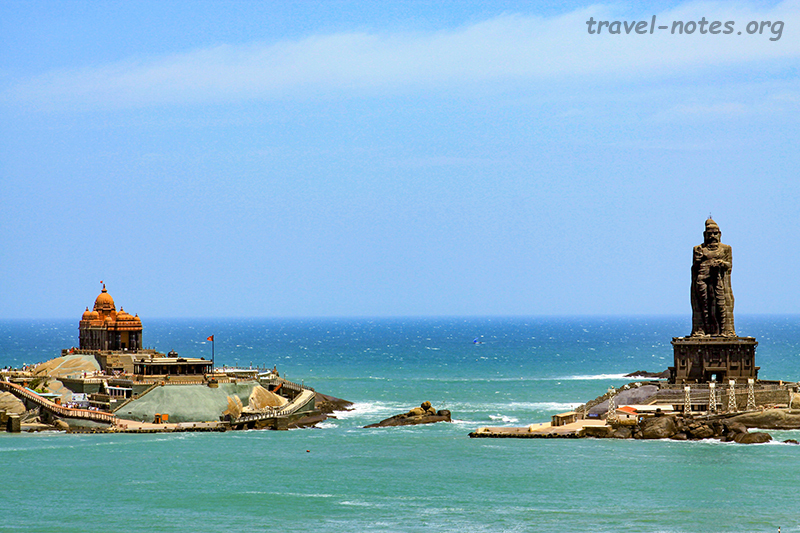 Click here for more photos from Kanyakumari. 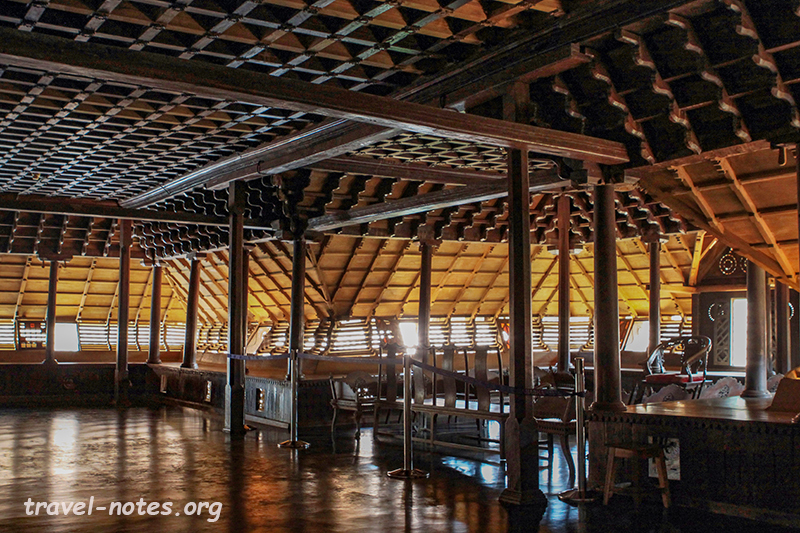 Click here for more photos from Padmanabhapuram Palace. Click here for more photos from Mamallapuram. Click here for more photos from Rameshwaram and other minor sights.